A few words about Ancient Market.. The Agora of Thassos was the political, administrative and religious centre of the ancient city of the island and is the most important archaeological monument complex, which took its final form over many centuries. Early structures have been identified dating from the 6th century BC. This was a public square which was enclosed by colonnaded arcades, which formed the façade of public complex and stood out for the so called “Diodos ton Theoron”, which was one of the most important sites of the city bearing religious significance. In the complex were discovered sculptures, statues and invaluable inscriptions, many of which are now in the Louvre museum in Paris. In the northwestern part there is the sacred shrine of Thassian Agoreous Zeus with circular enclosure of marble columns and slabs of stone, also the tomb of Glaucus, the circular altar of Theagenes, who was one of the most glorious Thassian athletes, the altar of Gaios and Lefkios Caesar, the marble bow and the early Christian Basilica of Agora with dimensions that allowed a great number of believers to attend mass. The Agora of Thassos was brought to light during the excavations conducted by the French Archaeological School that begun in 1911. The bulk excavation and revelation of the site took place from 1948 to 1955. The excavation of the French Archaeological School continues at the same place until this date. 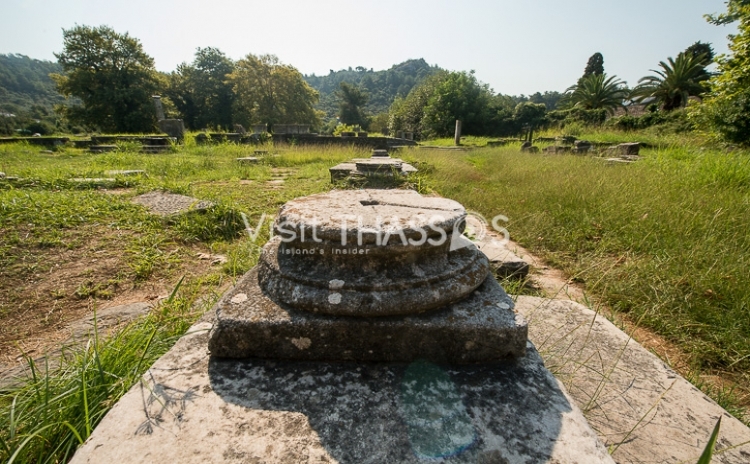 The Agora of Thassos was the political, administrative and religious centre of the ancient city of the island and is the most important archaeological monument complex, which took its final form over many centuries.